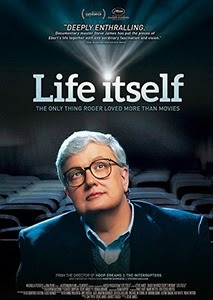 When Gene Siskel – Roger Ebert’s partner on the pioneering movie review show Siskel & Ebert at the Movies – was diagnosed with a terminal brain tumour in 1998, he decided to only tell his close family, keeping his friends and colleagues in the dark as to the severity of the illness. When Siskel died in 1999, Ebert vowed to live in the open and, when he himself became seriously ill, he reached outward, sharing his thoughts, hopes and fears with his readership in great detail. For Ebert, life itself took on a new meaning under the encroaching shadow of death. While Steve James’ Life Itself (2014) is ostensibly a documentary about Ebert’s life, it ultimately becomes a film about what we live for. Painfully raw and moving footage of Ebert’s last days in the hospital, surrounded by his family, constitute the apex of James’ new outlook. The nakedness of the experience is often difficult to watch, but Ebert needs us as witnesses; it seems like the logical approach for a life lived for readers and movie watchers. After a lifetime writing about cinema, Ebert becomes the movie, and fittingly his final communion with us happens through a screen. It’s hard to overstate the poignancy of this. As death approaches, we sense the urgency of life; we cast away the details and ephemera, focusing instead on the man, those he loves and those who loved him in return. His determination is heart-wrenching; he is physically broken, but the totality of his experiences is embodied in his fragile frame. The great difficulty for James is in reconciling these powerful sequences with the more traditional elements of a narrative documentary which, in this case, come from Ebert’s memoirs of the same name. The emotional tone of the hospital scenes essentially dictates James’ approach to the detail of Ebert’s story. Its uncritical hero-worshipping is completely understandable, but it betrays a cautiousness at the film’s heart that consequently underserves certain elements of the picture’s focus. Ebert was a great critic, but he wasn’t infallible. James could have still respected his memory while digging a little deeper and perhaps placing Ebert’s criticism through the decades in the context of the constantly shifting state of the art. One of the great unexpected pleasures of Life Itself is the way it gently prompts viewers to consider their own relationship with film criticism today. In a Millennial culture built on ‘poptimism’ and a notable distrust of cynicism, we should take note of the importance Ebert placed on opinions and arguments as ways of judging your own relationship to a film. In discussion, debate and even conflict, we locate the heart of the art. Additionally, we are reminded of his great humanist view of cinema. “He did not get caught up in certain ideologies about what cinema should be”, says Martin Scorsese in the film. It’s a reminder for us to be open with this great art form. There is no ideology, just cinema and life itself.